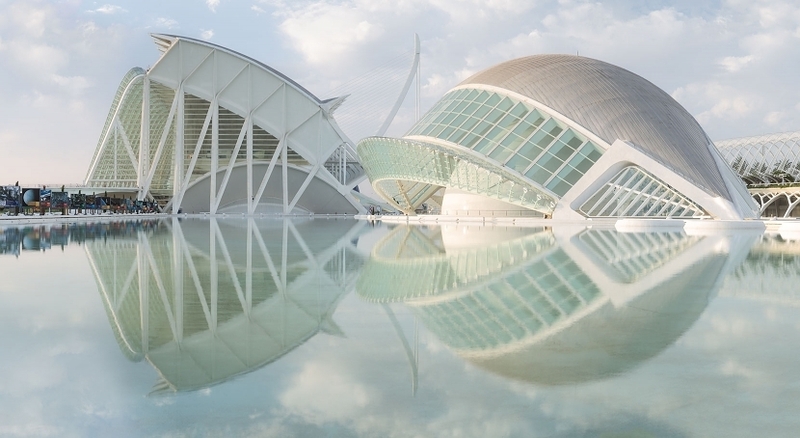 Here's a shot from yesterday's shoot of The City of Arts and Sciences. It's been remarkably still every morning, the wind only picking up around an hour after the sun has risen. This has made fantastic images to get those all important reflections. This is a five shot stitich from the Canon 6D with 24-70mm f2.8L mk2, but alongside this I have been trialling a remarkable new camera that will change the way I work as a travel photographer - the Canon EOS M3. I have been loaned a full set of lenses to use with this fabulous crop sensor body - the 11-22mm, 18-55mm, 55-200mm and the 22mm prime. They are all brilliant performers and that means a lot coming from me... the whole kit weighing lighter than the 6D and 24-70mm combined. The lenses are also extremely sharp and easy to use, although it does take a little time to get used to the button layout. The menus are of course 'a-la-canon' so its a breeze to operate instinctively. More on this to come.... In the mean time, have a look at the black and white version in my portfolio in all its retinal glory.